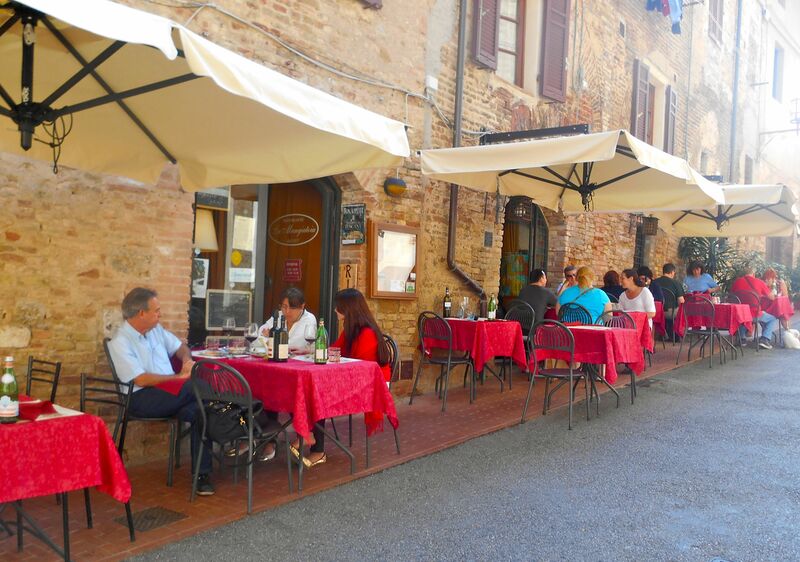 When in Tuscany…visit San Gimignano! It’s one of the first things everyone who’s been there says, so who am I to argue? This town of towers rises high on a hill clearly visible from miles away. Legend has it that in 63BC, two brothers escaping trouble in Rome built two castles here which later developed into San Gimignano. Its position along the Via Fancigena, which became the route of the pilgrims who travelled to Rome, meant the town expanded as a stopping site for travellers from around 100-300AD. Since then, there have been plenty of ups and downs for this uniquely beautiful place, with prosperous agricultural times until the plague of 1348 killed two-thirds of the population when it fell into a long period of decline. Now that’s some plague! In the 14th century every well-off family in town built a tower to show its power, all trying to go higher than each other. In the end there were 72 of them and there are still 13 standing. San Gimignano now survives on agriculture and of course the millions of tourists every year who visit. It’s the home of saffron which has been grown here for centuries. This amazing spice needs careful treatment with the harvest being done at dawn when the flowers are still closed. The saffron stigmas then have to be dried immediately and you need 150,000 flowers to produce 1kg of saffron. It’s a serious businesses! We stayed in nearby Siena, so caught the bus. It’s just a short ride (not much more than an hour) and public transport is great in Italy – cheap, clean and punctual. You’re dropped just outside the town walls, ready to start your exploration. 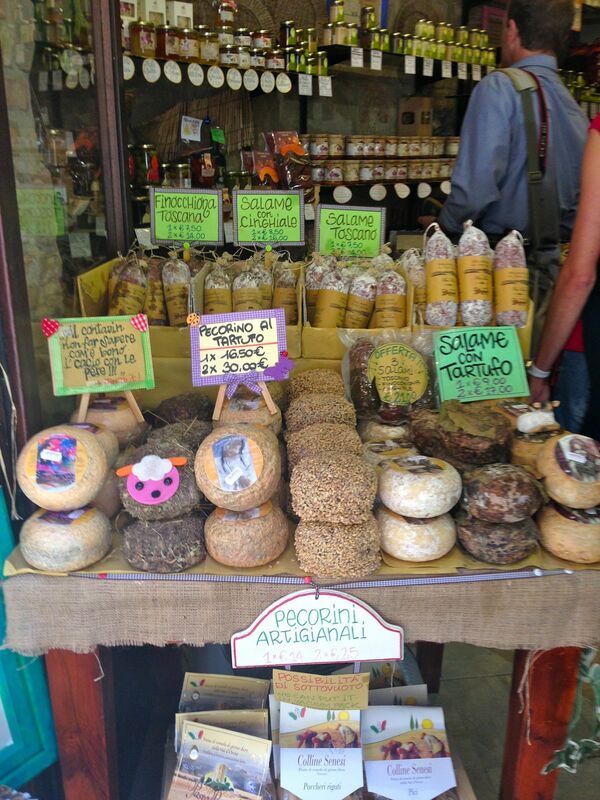 There’s no doubting that San Gimignano exists mainly for the tourists but even though there were a fair few of us ambling around, it didn’t feel crowded or unpleasant and there are plenty of lovely (touristy) shops selling local delicacies like cheese, olive oil, wine and various other Italian delights. I am now the proud owner of a beautiful olive-wood board, which you have no doubt seen in previous blog posts. 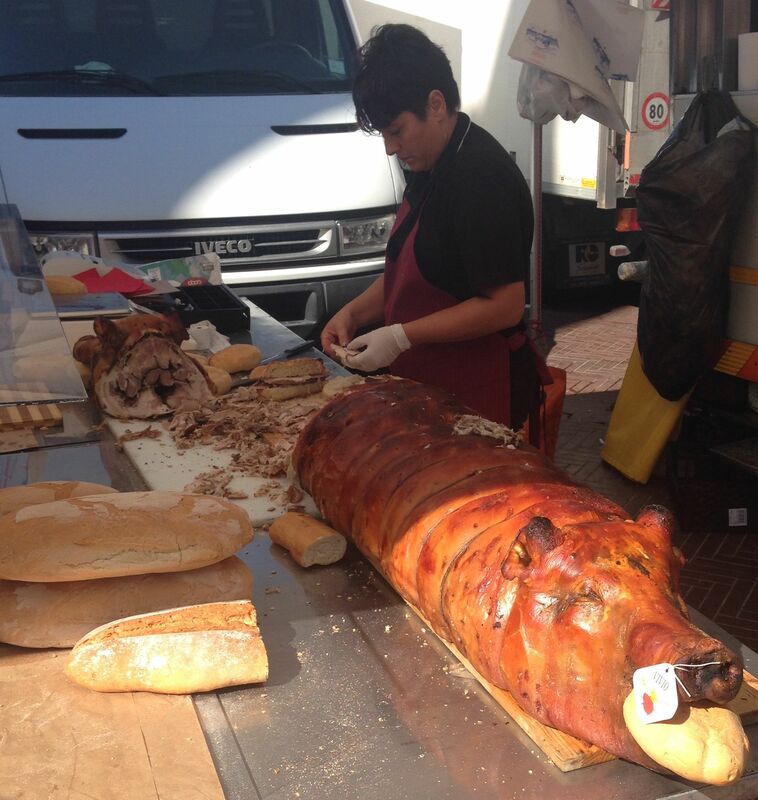 In the main square there was a busy market and my favourite stall was this porchetta one! They were serving up beautifully fresh rolls, packed with chunks of the best pork ever. Sorry if you’re squeamish about the picture, it just screams Italy to me! Not too much time to linger over the food in the market, though, as there was (as ever) the serious business of lunch to deal with. We’d been recommended La Mangiatoia (it means the trough!) which of course we sought out – local knowledge and all that. It’s set on a little side street, a short hop away from the bustle of the main thoroughfare. We settled down at a table in the street and ordered a bottle for Vernaccia which is the crisp, dry white wine that is produced locally. Perfect! 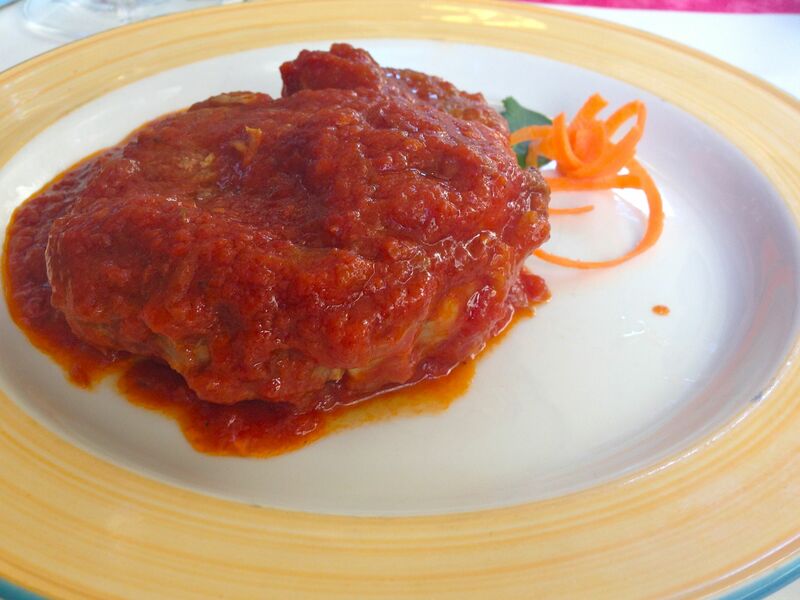 The menu is full of Italian classics – I had to go for the Osso Bucco. The meat fell apart and the rich tomatoey sauce tasted like it had been made with love. 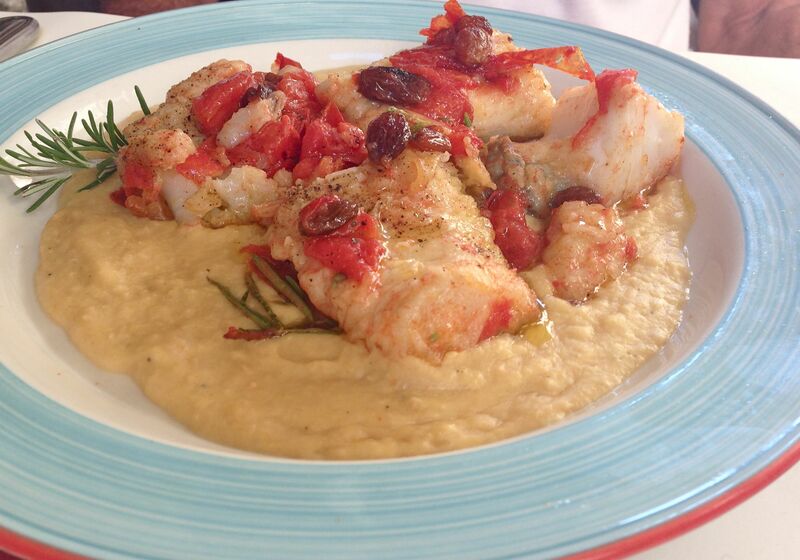 This beautiful cod dish came on a bed of chickpea puree, delicately flavoured with rosemary. 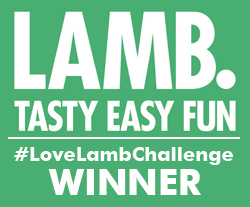 The flavours went toether perfectly – I’m going to have to try making it myself. After lunch it’s time for ice cream – well we are in Italy after all. The ice cream shops in one of the main square boldly advertise themselves as selling the best ice cream in the world. That’s some claim, but it is wonderful…and the choice is mind blowing. The one shop had over 30 different flavours, how do you choose? The best thing would be to go back every day for another one and get through the whole stock – happy to take that on! 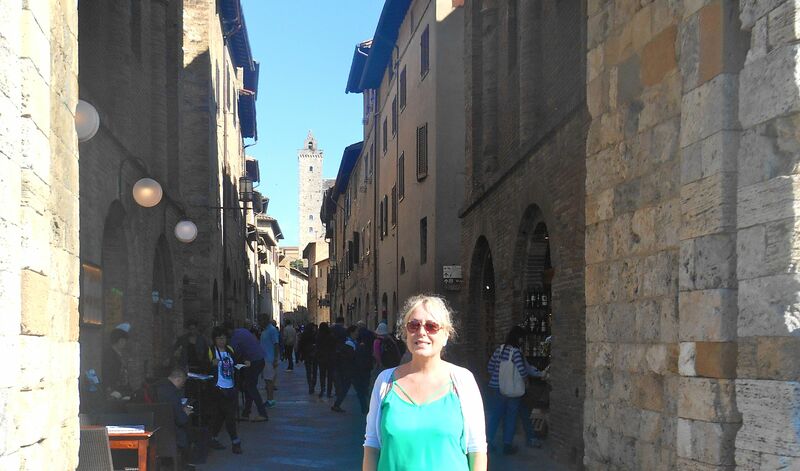 I loved San Gimignano with its sweeping views, amazing food for sale, from fresh produce to cheese, meats and oils and so many restaurants and cafes serving the best cappucinos and all manner of Italian delights. You can even sort of imagine what living there 2000 years ago must have been like…sort of!